Wallace (Wally) Bradley was born in Hewins, Kansas, February 12, 1926. 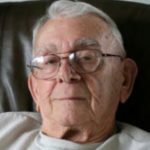 Wally joined the US Navy during WWII serving as Seaman First Class Gunner’s Mate aboard the USS Little DD-803, which was sunk by Japanese Kamikaze during the Battle of Okinawa. Wally married Kathryn Carmean January 25, 1946 and settled in Pasco, WA, where he managed Safeway grocery. In the early 1970’s Wally changed careers as a Deputy Sheriff for Franklin County, Washington Sheriff Department, where he was promoted to Undersheriff and later elected to two terms as Sheriff. Wally is preceded in death by parents Arley and Zelan Bradley, wife Kathryn, and brothers Warren, Wesley, and Wilbur. Wally is survived by his children Linda DeMerritt (Rick) Covington, WA, Bryon Bradley (Sue) Richland, WA, Carol Bradley Kennewick, WA, Gene Bradley (Sarah) Mill Creek, WA and numerous grand/great-grandchildren, nieces, nephews, and cousins.